Make / ART / Work will be a day-long conference of professional skill development for Okanogan County artists. The event will feature workshops and presentations of skills useful to artists, in all disciplines and at all levels. Roxanne Best and Cassandra Waters on developing an artist business plan. Presented in partnership by Northwest Native Development Fund and Roxtography, Roxanne and Cassandra will introduce the basics of a successful business plan. This overview will cover the importance of a formal plan and a look at what to expect when applying to grants. The presentation will touch on topics such as artist statements, identifying target markets, and art profitability. Christine Malek, artist and owner of Gallery Boom in Olympia, will cover finding your audience, markets, and pricing your artwork. This presentation will discuss strategies for finding and developing an audience, the art market, and how to price your work. Entrepreneur and artist Jenn Tate will present why artists need a website in today’s art market. Jenn will offer insight on how building a viable website can get an artist much-needed recognition. Local artist, Perri Howard, will discuss the world of public art, illuminating the process of making permanent public works. This presentation will show examples of successful projects, how to scale and transform 2-D visual works, and the administrative side of public art. 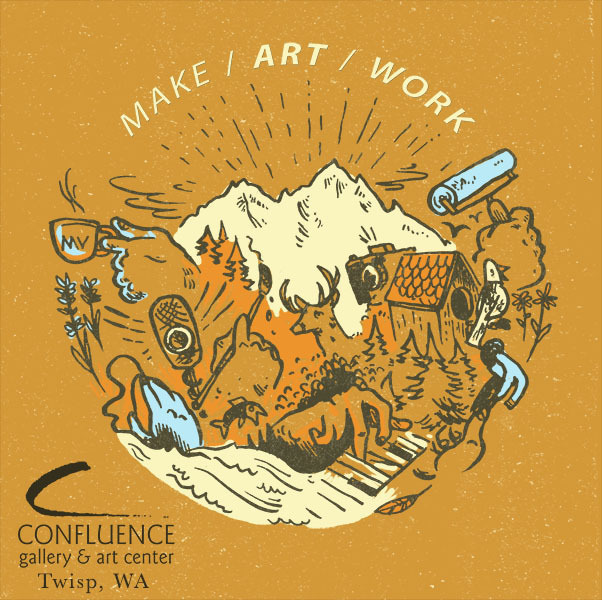 Confluence Gallery and Art Center seeks to cultivate a vibrant community by connecting artists with the skills, information, and services they need to make a living as an artist in rural Eastern Washington State. CGAC believes that fostering artist success will build vitality in the community.